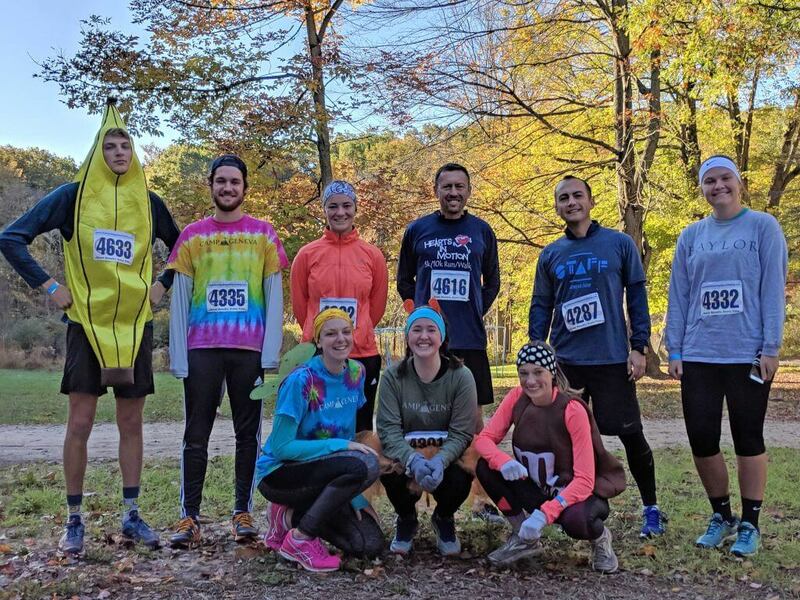 Presented by Howard Miller, the annual Run for Camp took place at Camp Henry in Newaygo on October 13. The 5K trail run, a partnership between Camp Geneva, Camp Roger, and Camp Henry, raises money for camper scholarships. All three camps have a long history and commitment to making a summer camp experience accessible to all children and families – regardless of their ability to pay. Together we believe that everyone should have the opportunity to benefit from a positive, fun-filled, loving and life-changing Christian camping experience. Out of 116 participants we are proud to say that the overall winner was GENEVA’s own summer staffer Andrew John Kalthoff (and he ran in a banana costume!) with a time of 20:21.3. The 2019 Run for Camp will take place on Saturday, October 12, at Camp Henry. Registration information will be available this summer. Team Kevin (fondly named for GENEVA’s Executive Director) included members of the summer staff along with Program Director Brian VanderWege and Executive Director Kevin VanderKlok.